Wakefield Country Day School recognizes and encourages strong academic leadership and strong character traits in its students. In honor of 2Lt. Leonard M. Cowherd III, a 1999 graduate of Wakefield Country Day School who went on to West Point and honorably served his country in Operation Iraqi Freedom, WCDS offers one full tuition paid scholarship per year for a high school student who exemplifies the attributes Army 2Lt. Leonard Cowherd III embodied. Cowherd was killed on May 16, 2004, by sniper fire while serving his country in Iraq. He was just 22 years old. As a high school student and young leader at WCDS, 2Lt. Cowherd consistently demonstrated hard work, commitment, ethical behavior, and academic achievement. He was a first honors student who played a variety of sports, appeared in annual school plays, and served as Vice President of the Student Government and Class Salutatorian his senior year. The intent of this scholarship is to identify individuals who exemplify the character traits exhibited by 2Lt. Cowherd and, thereby, do honor to themselves and his memory. This need-based scholarship covers the tuition expenses of up to four years of high school and is renewable each year, provided the student continues to demonstrate academic and moral excellence. Specifically, students must maintain at least a B average (minimum of 8.0 on a 10-point scale) throughout each academic year and perform a minimum of 20 hours of community service each year. Criteria for consideration include: academic achievements, special talents, commitment to service, leadership, and strong moral character. All aspects of the Application for Admission (academic transcripts, recommendations, essay and interviews) are considered when evaluating the scholarship application. Our newest Cowherd scholar is Alexandra Lutz of Front Royal. She will join WCDS in grade 10 for the 2017-18 school year. Trey Jenkins of Boston, VA, joined our school this past year as a Cowherd scholar. Jenkins will be a senior this year. 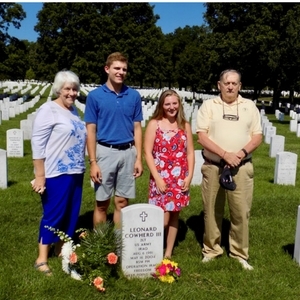 When Cowherd scholars are named, they are given the opportunity to meet Lt. Cowherd’s parents and visit Arlington Cemetery to pay tribute to Cowherd to reinforce the sacrifice that underlies the scholarship opportunity.